Share-A-Pet Pawsitive Reading Program takes dogs into schools. In addition to serving Children’s hospitals and schools for the developmentally disabled, Share-A-Pet has launched its ‘Pawsitive Reading’ program to serve the schools in our area. 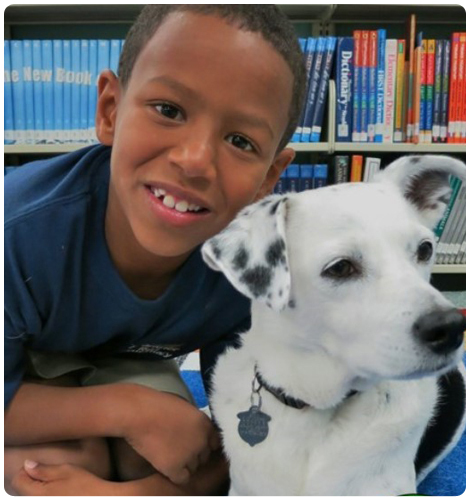 The program began at Coral Sunset Elementary School in Boca Raton, Florida, where the school adopted our Pawsitive Reading Program to help students grow comfortable with books while reading to our dogs. The mission of this program is to provide children the means to improve their reading skills in a supportive atmosphere created by the Share-A-Pet volunteers and therapy dogs. Those of us who own dogs know the joy and therapeutic benefit that they bring to us on a daily basis. Dogs, by virtue of their nature, have only unconditional love to offer. They make in fact, very good listeners! They do not criticize or judge a child’s reading ability. Dogs like to be spoken to and love the attention they receive from the reader. In turn, they can “reward” the reader by allowing themselves to be petted or by shaking paws. Thus the ‘pawsitive’ dogs provide the therapeutic environment necessary for successful implementation of ‘Pawsitive Reading’. The program consists of developing basic strategies (1) for the children to develop and improve their reading skills, (2) to have the children read aloud to other children and to the ‘pawsitive’ dog, (3) for children to work independently and (4) to provide children with a sense of pride in their reading accomplishments.reading child 22 The use of certified therapy dogs in literacy programs is finding widespread success across the country. Teachers seeking innovative ways to build motivation and interest among reluctant readers have found that bringing a dog into the classroom creates excitement and boosts self confidence in their students. Trained volunteer teams of dogs and handlers work collaboratively with teachers to meet their school’s reading fluency goals. In addition to increased reading fluency, teachers have also noted that the students who participated also volunteered to read aloud in class, checked books out of the library and had a sense of pride in their accomplishments. Students are excited by the chance to spend time reading to their furry friend. Because of their natural affinity with animals, children who may have been embarrassed to read aloud, let down their guard and begin feeling relaxed while reading with the dog’s head in their lap. Even students in the classroom who are reading at grade level may earn the privilege of reading to the dog, because it is fun and non-stressful. The program goals are manifold and include providing children with a supportive, non- judgmental environment where they learn to read fluently, to learn how books work and to know that print carries meaning. In addition, we aim to have children enrolled in the ‘Pawsitive Reading’ program develop self confidence and social skills, be interested and intrigued by learning and make reading a fun exercise. Literacy and reading fluency are the cornerstones of educational success. When children fall behind in their reading skills they can lose precious time in all of their subjects, putting them at- risk of academic failure. In 2008, for example, 34% of students in public elementary schools in Florida’s Broward and Palm Beach counties failed to meet the FCAT standards for reading on grade level (FL Dept. of Education, School Accountability Reports 2007-2008). A similar report indicated that students who did not meet yearly progress goals for reading proficiency were black, economically disadvantaged, English language learners or disabled (FL Dept. of Education, Adequate Yearly Progress Report by District). By including these higher risk groups and giving them enriched programming and additional help with basic reading skills, schools could make strides to improve their progress. The community benefits when students succeed academically at a young age and have the skills to complete high school and seek a college education. With budget constraints in many public schools, it is difficult for teachers to meet the minimum requirements issued by the state and school districts. Economically disadvantaged students who have learning disabilities or other barriers to learning can be helped with intensive remedial interventions. However, this is not always an option. Our free Pawsitive Reading Program is a welcome adjunct to existing curriculum as it reinforces the basic reading skills, the foundation of all learning. Why Is Pet Therapy Important? Positively transforming institutions such as hospitals, nursing homes and children’s centers begins with infusing them with love. When patients have access to the unconditional love of therapy dogs they not only benefit physically, but mentally and emotionally as well. Statistics show that these causes lead to depression, withdrawal from others and the world at large, increased need for medications, all leading to a breakdown in the mental and physical well-being, resulting in premature death. Studies have shown that an environment infused with the ability to love and be loved alleviates loneliness, helplessness and boredom. 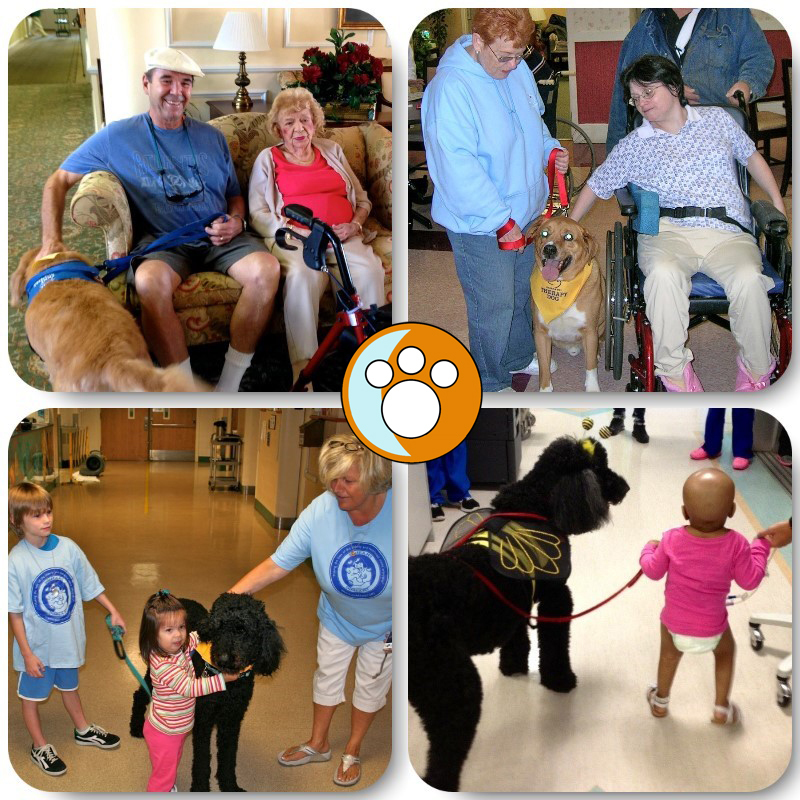 Share-A-Pet Assisted Therapy offers patients an unconditionally loving environment. facility resulting in an improved and more purposeful life. therapy team in the country. At Share-A-Pet we know that a dedicated volunteer team comes from a dedicated Share-A-Pet Staff. That is why we decided to be more than just a registering or certification agency. We recruit, train, certify, insure, place and oversee all of our members. Our relationship with them and support for them endures throughout their membership. It is for this reason that Share-A-Pet is made up of dedicated volunteer teams visiting facilities on a weekly basis. 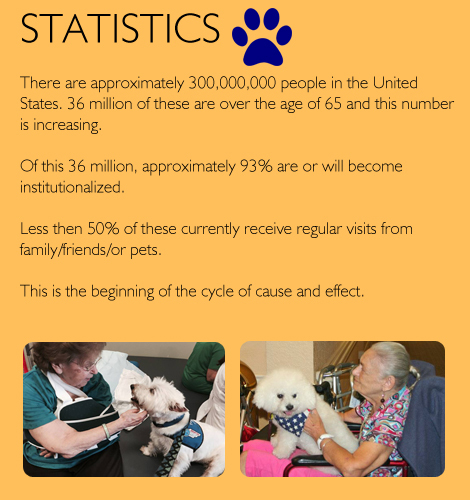 It is for this reason that Share-A-Pet volunteer teams are pawsitively changing the lives of individuals in hospitals, nursing homes, children’s centers and schools. It is for this reason that the lives of our volunteer teams are also being transformed for the better. We are all benefitting from our dedication. But it is not just our dedication to our visits that makes this miracle happen. Our staff and are members have to work together for the success of our mission. For this we have created our Paws of Progress which explains all the ways that we all help Share-A-Pet grow and reach more and more people in need. Our two-way street, member support and supporting members, paves the golden street of happiness for those we serve. There is no end to what we will do to help our volunteers be the best they can be, from their extensive training to staff and software support. Dedicated members need only apply!